Call for volunteers to participate in the annual Nationwide butterfly survey led by the North American Butterfly Association. The goals of this survey are to gather data that will monitor butterfly populations, have fun, and raise public awareness. Our survey area is a circle with a 7.5 mile radius centered on Manassas Airport. Call us at 703.499.4954 or email alliance@ pwconserve.org so we can add you to a survey team, no matter your skill level. You can find Mourning Cloak butterflies in many habitats, from neighborhoods to the forest. Males perch on low branches or the ground awaiting females and patrol along trails. Discover native plants for your back yard habitat! Blooming now, Wild Ginger is a larval host to Pipeline Swallowtail butterflies. It's a colony-forming perennial that creates a dense ground cover in shady woodlands. It has heart-shaped leaves and a single red-brown flower. Monday, May 22, 5:30 to 7pm at Prince William Conservation Alliance, 2241F Tackett's Mill Drive, Woodbridge 22192. Eat, drink, and think green! Meet new friends and learn more about wildlife in the suburbs. Bring your questions. Free of charge, everyone is welcome. Saturday, May 20, 9am to noon at the Stone House at Merrimac Farm, 15014 Deepwood Lane, Nokesville. Thanks to community support, we created an area at Merrimac Farm WMA where people can watch wildlife, learn about native plants and pollinators, and get ideas for your own backyard. Help us keep a check on invasive plants and plant some new plants. Even if you can join us just once or twice, your help makes a difference. Sunday, May 21, 1:30 to 3pm, meet in the parking lot for K9 Gunner Dog Park, near the intersection of Minnieville Road and Colby Drive. Our Minnieville Buffer project transformed a barren slope from an environmental problem into an attractive buffer that showcases Virginia’s native plants. From afar, it's a spot of color along Minnieville Road. Closer in, the plants are attracting birds and butterflies. For both projects ... We have tools, bring water to drink. Wear long pants, sturdy shoes, and long socks. Questions and RSVP (appreciated) to alliance@ pwconserve.org or 703-499-4954. Monday, June 4 at 4pm, meet at the Stone House, 15014 Deepwood Lane, Nokesville. RSVP appreciated to alliance@ pwconserve.org, 703.499.4954. Pollinators make the world go round. 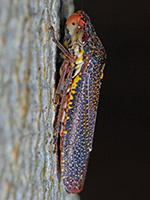 Plus they're fascinating and have cool names such as the Speckled Sharpshooter, a Leafhopper that overwinters sheltered in leaf litter. 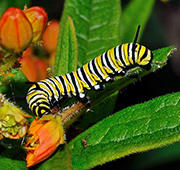 Join us to learn more about insects and help build a species list for this great natural area. Thursday, May 25, 7:30 at the Development Services Building, Room 105. Sponsored by Historic Prince William. The house construction boom in Prince William started after the Shirley Highway reached the Occoquan River in 1950. Hylton Enterprises took a lead role, building places such as Dale City as fast as sewage plant capacity allowed. PWC Demographer Brian Engelmann will speak to a period in the county's history dominated by a housing boom, and a location advertised as an affordable, quiet, and more spacious lifestyle just 25 minutes from the Pentagon.